See also our newsletters page for historical news & articles. The 2019 Swiss Pairs competition will take place at Trumpington Village Hall on April 28th, 1pm start. The Green Pointed EABW run jointly by Cambs & Hunts, Suffolk and Norfolk in Elmswell, was a great success. Full results can be viewed by following the links on the Suffolk Bridge website. Thank you to all the organisers - Elmswell Community Centre was a very good venue for this joint venture. 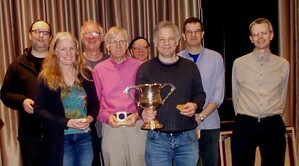 Cambs & Hunts has won the Tollemache Cup - the inter-county teams of eight championship - claiming the trophy for the second time (the first in 1980). The team (pictured) was: Paul Barden, David Kendrick (who was also part of the 1980 winning team for Cambs & Hunts), Jonathan Mestel, Jon Cooke, Giles Woodruff, Julian Wightwick, Catherine Curtis & Paul Fegarty. They finished on 88 VPs, 7 ahead of Berks & Bucks, with Manchester finishing third. Catherine Jagger, Graham Hazel and Victor Milman also played in the qualifying round, winning their group last November. Full results may be seen on the EBU website. The final of the County Individual was held at Dry Drayton on Sunday February 17th. 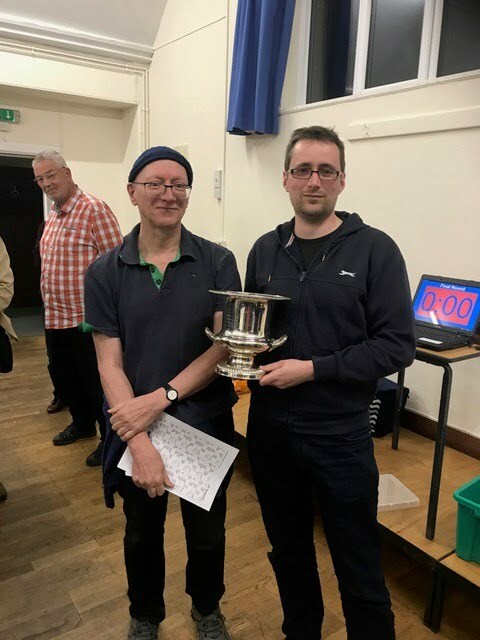 20 players took part and the winner was Michael Clydesdale (left) with David Man second. Congratulations to them both and many thanks to Dry Drayton for hosting the event. Congratulations to all the teams who played in the ECL Match against Suffolk - the A team won 20-0; the B team 17-3; the C team 15-5. Congratulations to all 3 teams for the results in the ECL Match against Bedfordshire on 9th December 2018. The A team won 16-4; C team won 19-1; B team drew 10-10, but with a moral victory of +2 imps. For those of you who are interested, minutes from the recent County Committee Meeting are attached and those from previous meetings can be found in the 'Documents' section.